The WWDC rumor spotlight has been shining squarely on new iPhone hardware and software that Apple is expected to announce during Monday's keynote. But thanks to some noticeable recent speed boosts and some scheduled maintenance Thursday night, it's starting to look like MobileMe may get its 15 minutes of fame on stage as well. The rebranded version of .Mac suffered a number of problems last year, due largely to Apple's unfortunate decision to launch it on the same day as a new phone and major software upgrade. Fortunately, Apple has spent the past year fortifying MobileMe's reliability and polishing existing features, so it may very well be time for "MobileMe 2.0" to bring some major new features and tweaks. 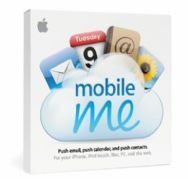 Here are a few moves Apple could make to build upon MobileMe's foundations and turn it into a mature, reliable product. MobileMe's Web apps—Mail, Calendar, Address Book, Gallery, Contacts, and iDisk—are decent versions of their desktop equivalents, but they could definitely benefit from gaining more of their desktop siblings' features. For instance, it would be great to be able to add alarms when creating events and to-dos in the Calendar Web app. Creating events from Mail messages would also be a blessing, and adding photos to the Gallery straight from Mail attachments wouldn't hurt either. Let's face it, the iDisk is a great idea that, so far, has yet to actually work well. It's slow as molasses and doesn't even support Apple's own package format for files made with Pages, Keynote, or third-party apps like RapidWeaver. In MobileMe 2.0, it would be great to see iDisk increase its speed to match the competitors—such as Dropbox—that are eating Apple's online storage lunch, as well as support for Apple's own file formats. More collaboration features for sharing specific folders with others would be great too. In iLife '09, iWeb ( ) finally became a pretty formidable tool for making basic, good-looking Web sites and blogs, but MobileMe's hosting services are still very one-way. Sure, comments are allowed on blog posts, but not on Gallery photos or albums. MobileMe is also devoid of traffic or visitor statistics of any kind. Unless you use third-party tools like iWeb Buddy to inject that code after every publishing session, users remain in the dark about the most basic of details, like how many people visited their site today. It would be great to see a slightly more social MobileMe that offers at least basic visitor stats and more interactive features. This is admittedly a bit of a Hail Mary, but keep an open mind. Between Hulu and Web-based music library stores like Lala, the rest of the Web is streaming just about any kind of media you want. It would be great to see Apple put that $99-per-year MobileMe fee to even better use and allow members to stream their iTunes content and playlists over the net. Imagine working at a coffee shop, the office, or even halfway across the country and never being without the content you forgot to load onto your iPhone or iPod before leaving the house. After tying your MobileMe membership to your iTunes Store account, you could stream all the music (or, heck, video) that you have purchased through the store. This would be a win-win for the studios and Apple: more content would sell through iTunes because it becomes ubiquitous and Apple sells more MobileMe subscriptions. Recently, Apple quietly introduced the ability to report mail as spam from the MobileMe Web interface. This is akin to Gmail's spam-reporting feature, which let users directly contribute to making Google's filters better. But whatever Apple is currently using to protect MobileMe members from spam isn't very good. Crowd-sourced spam filters are nice, but a big upgrade in spam prevention would go a long way towards cutting down on inbox clutter for active members who depend on MobileMe's unique mail features. Yep, we couldn't get through a MobileMe piece without mentioning the iPhone. MobileMe e-mail aliases are one of the service's most underrated features. They allow members to create multiple addresses that all funnel into the same inbox for personal, shopping, or other purposes. If one address is no longer needed or begins collecting too much spam, it can simply be shut off or deleted, blocking all incoming messages. These aliases are much easier to set up and filter, as they do not require adding an entirely new account to an e-mail client or setting up complicated forwarding routines. Unfortunately, MobileMe e-mail aliases are not yet supported on the iPhone OS. If you reply to a message sent to an alias, you will expose your main MobileMe address. Support for aliases in the iPhone OS would be a huge boon for their appeal to mobile warriors—and isn't being mobile what MobileMe is all about? Most of MobileMe’s key applications and services are accessible on the iPhone through native apps like Mail, Contacts, and Calendar (with the still-puzzling exclusion of managing to-dos). But while iPhone OS 3 brings a better UI for publishing photos (and possibly videos) to a MobileMe Gallery, there is no way to manage one’s gallery on-the-go. If you need to reorganize photos or delete a picture that perhaps should not have been unveiled to the entire Internet to begin with (*ahem*), you’re out of luck until you get back to a computer. There are third-party apps designed to fill in for the iPhone OS’s inability to access one’s iDisk, such as Air Sharing Pro and Quickoffice Files ( , formerly Mobile Files Pro), but whether it be through full-fledged native applications or a slick Mobile Safari formatted site, it would be great to see the rest of MobileMe come to one of Apple’s key devices. That's about it on our MobileMe 2.0 wishlist, so it's time to ask the inevitable: what did we miss?